Home > Back Care Tips > How do you spot a healthy carbohydrate? How do you spot a healthy carbohydrate? Last month we were discussing sugar in your diet; how too much can lead to joint inflammation, and the pros and cons of different substitutes. Now it’s time to talk about carbohydrates, which are an essential part of a healthy diet. Carbs are the most common source of energy for most living organisms. Once consumed, they turn into glucose in your body, providing energy for muscle and brain function. They can be found in the food we eat every day such as grains, fruits, vegetables, and milk products. Essentially, we could get all our nutrients from protein and fats. One gram of carbohydrates is equivalent to 4 kilocalories of energy, similar to protein, while fats provide 9 kilocalories of energy per gram. Although it is possible to survive on a low-carb or zero-carb diet, that may not the best choice. There are many carbohydrate-rich foods that are healthy and beneficial to your diet, for instance, fruits and vegetables. Carbohydrates are often blamed for weight gain, however, being able to distinguish healthy and unhealthy carbs can actually help you maintain a healthy weight. The current dietary requirements according to the U.S. Department of Health and Human Services recommend that healthy adults should consume up to 45–65% of their calories from carbohydrates, which is approximately 200 to 300 grams of carbohydrates per day. Chiropractors are trained in nutrition. If you have any questions regarding your diet speak to your community chiropractor. 1. Coffman, M. What percentage of my daily calories should come from carbohydrates? SF Gate. Available at: http://healthyeating.sfgate.com/percentage-daily-calories-should-come-carbohydrates-1810.html. Accessed February 8, 2018. 2. Szalay, J. 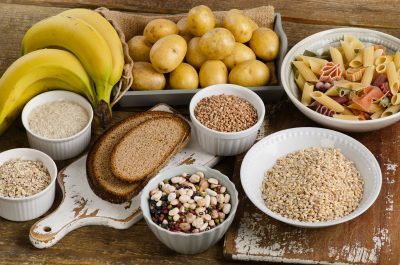 What are carbohydrates? Live Science. July 14, 2017. Available at: https://www.livescience.com/51976-carbohydrates.html. Accessed January 19, 2018. 3. Nordqvist C. What you need to know about carbs. Medical News Today. Last updated October 17, 2017. Available at: https://www.medicalnewstoday.com/articles/161547.php. Accessed January 26, 2018.